Basic facts about South Sudan, which is due to split Africa’s largest country in two when it proclaims full independence to become the world’s newest nation. South Sudan proclaims full independence on Saturday, splitting Africa’s largest country in two to become the world’s newest nation. GEOGRAPHY: South Sudan is bordered to the east by Ethiopia, to the south by Kenya and Uganda and to the west by the Democratic Republic of Congo and the Central African Republic. AREA: 589,745 square kilometres, or 227,701 square miles, or 24 percent of the whole of Sudan. POPULATION: More than 8.5 million people, or 20 percent of the Sudanese population. CAPITAL: Juba. Main towns: Rumbek, Malakal, Wau. RELIGION: Mainly Christian and traditional beliefs, but many Muslims too. LANGUAGE: English is the official language of the government. A form of Arabic also widely spoken. HISTORY: Sudan was jointly ruled by Britain and Egypt from 1899 until independence in 1956. From 1955 until 1972 Sudan was rocked by civil war, pitting successive governments against southern rebels. The conflict ended with a treaty in 1972 that granted partial autonomy to the south. In 1983 Khartoum reneged on the accord, provoking a new civil war between north and south that left two million dead and four million displaced. John Garang formed the rebel Sudan People’s Liberation Army, or SPLA. Africa’s longest war ended on January 9, 2005, when Garang signed a peace accord with Khartoum, which exempted the south from sharia, or Islamic law, and granted it six years of self-rule ahead of a referendum on independence. In January 2011, south Sudan voted to secede from the north by 98.83 percent. POLITICAL INSTITUTIONS: The former SPLA southern rebels partnered with their former adversaries in Khartoum to form a government of national unity in 2005, to run the country in line with a new constitution. Elections in April 2010 extended the mandate of Salva Kiir, who replaced Garang after he was killed in a helicopter accident in July 2005, as president of the south. A separate parliament was also set up in the south, headed by Kiir. ECONOMY: After decades of devastating conflict with the north, south Sudan remains a grossly underdeveloped region, despite Sudan’s current 6.7 billion barrels of oil reserves. Of the 470,000 barrels per day pumped pre-independence, three quarters come from the south and border regions. The oil, which provides up to 98 percent of south Sudan’s income, is exported by pipeline through the north to the Red Sea. The south is also rich in other minerals including uranium and has vast agricultural potential that remains largely unexploited because of the war. ARMED FORCES: The Sudan People’s Liberation Army has around 140,000 troops, according to the Geneva-based Small Arms Survey. Nearly 10,000 peacekeeping soldiers from the United Nations Mission in Sudan (UNMIS), whose mandate expires on July 9, are deployed in the north and south. 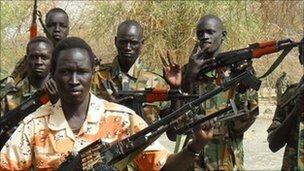 South Sudan Profile (from the BBC). South Sudan gained independence from Sudan on 9 July 2011 as the outcome of a 2005 peace deal that ended Africa’s longest-running civil war. An overwhelming majority of South Sudanese voted in a January 2011 referendum to secede and become Africa’s first new country since Eritrea split from Ethiopia in 1993. The new nation stands to benefit from inheriting the bulk of Sudan’s oil wealth, but continuing disputes with Khartoum and a lack of economic development cloud its immediate future. Formed from the 10 southern-most states of Sudan, South Sudan is a land of expansive grassland, swamps and tropical rain forest straddling both banks of the White Nile. It is highly diverse ethnically and linguistically. Among the largest ethnic groups are the Dinka, Nuer and Shilluk. Unlike the predominantly Muslim population of Sudan, the South Sudanese follow traditional religions, while a minority are Christians. In 1955, southern army officers mutinied, sparking off a civil war between the south, led by the Anya Nya guerrilla movement, and the Sudanese government. The conflict only ended when the Addis Ababa peace agreement of 1972 accorded the south a measure of autonomy. The conflict finally ended with the 2005 Comprehensive Peace Agreement, under which the south was granted regional autonomy along with guaranteed representation in a national power-sharing government. The agreement also provided for a referendum in the south on independence in 2011, in which 99% of southern Sudanese voted to split from Sudan. Long based on subsistence agriculture, South Sudan’s economy is now highly oil-dependent. While an estimated 75% of all the former Sudan’s oil reserves are in South Sudan, the refineries and the pipeline to the Red Sea are in Sudan. Under the 2005 accord, South Sudan received 50% of the former united Sudan’s oil proceeds, which provide the vast bulk of the country’s budget. But that arrangement was set to expire with independence. In January 2012, the breakdown of talks on the sharing of oil revenues led South Sudan to halt oil production and halve public spending on all but salaries. Despite the potential oil wealth, South Sudan is one of Africa’s least developed countries. However, the years since the 2005 peace accord ushered in an economic revival and investment in utilities and other infrastructure. Another border conflict zone is the Nuba Mountains region of Sudan’s South Kordofan state, where violence continues between the largely Christian and pro-SPLA Nuba people and northern government forces. Inside South Sudan, a cattle-raiding feud between rival ethnic groups in Jonglei state has left hundreds of people dead and some 100,000 displaced since independence. And several rebel forces opposed to the SPLM-dominated government have emerged, including the South Sudan Liberation Army (SSLA) of Peter Gadet and a force led former SPLA general George Athor. Juba says these forces are funded by Sudan, which denies the accusation. Mr Kiir was re-elected as president in multiparty polls in the south in April 2010. On South Sudan’s independence in July 2011, he became president of the new state. Prior to independence, he was also vice-president of Sudan, under the power-sharing arrangements put in place in the 2005 Comprehensive Peace Agreement (CPA). During a historic first visit to Sudan since independence, Salva Kiir in October 2011 ruled out a return armed conflict between the new neighbours, despite continuing tensions. He has also taken a tough line on corruption, and in September 2011 announced several measures to combat it, including plans to subjectgovernment contracts to procurement legislation and make officials publish their assets and earnings. Having fought in the south’s first civil war in the 1960s, Mr Kiir joined the Sudanese army after the 1972 peace agreement. He defected to the rebels again on the resumption of fighting in 1983, later emerging as the SPLM’s military leader. Born in 1951 in Bahr al-Ghazal state, he is a Christian and – like his, predecessor John Garang – a member of the Dinka, the largest ethnic group in South Sudan. Widely thought to lack Mr Garang’s charisma, Mr Kiir has a reputation for intelligence, integrity and being able to reconcile ethnic or political opponents. South Sudan’s fledgling media face immense logistical, economic, social and political challenges. Newsgathering can be problematic and the communications infrastructure is poor. Radio is the most popular medium, and scores of private stations, some with foreign funding, have sprung up. The Catholic Church and Internews, a US-based media development organisation, are key radio players. The BBC World Service broadcasts to Juba on 90 FM (Arabic) and 88.2 FM (English). Though expensive for many locals, newspapers rank second to radio in popularity. Most of the titles circulating in South Sudan publish in English. 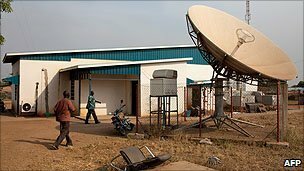 There is a terrestrial TV station – government-operated Southern Sudan TV. Media freedom is fragile, with the existence of armed groups, weak legal institutions and political pressures undermining free reporting. Journalists risk arrest over reports that criticise the government and the ruling party. There have been reported seizures of newspapers, or disruption of their distribution, by the authorities. Web access is limited to the main towns. Diaspora members tend to be the most active social network users. 1962 – Civil war led by the southern seperatist Anya Nya movement begins with north. 1969 – Group of socialist and communist Sudanese military officers led by Col Jaafar Muhammad Numeiri seizes power; Col Numeiri outlines policy of autonomy for south. 1972 – Government of Sudanese President Jaafar Numeiri concedes a measure of autonomy for southern Sudan in a peace agreement signed in Addis Ababa. 1978 – Oil discovered in Unity State in southern Sudan. Second civil war1983 – Fighting breaks out again between north and south Sudan, under leadership of John Garang’s Sudanese People’s Liberation Movement (SPLM), after Sudanese President Jaafar Numeiri abolishes South Sudan’s autonomy. 1988 – Democratic Unionist Party – part of Sudan’s ruling coalition government – drafts cease-fire agreement with the SPLM, but it is not implemented. 1989 – Military seizes power in Sudan. 1993 – Revolution Command Council dissolved after Omar Bashir is appointed president of Sudan. 2001 – Sudanese Islamist leader Hassan Al-Turabi’s party, the Popular National Congress, signs memorandum of understanding with the southern rebel SPLM’s armed wing, the Sudan People’s Liberation Army (SPLA). Mr Al-Turabi is arrested the next day. Sudanese government accepts Libyan-Egyptian initiative to end the Sudanese civil war after failure of peace talks between SPLM leader John Garang and President Omar Bashir in Nairobi. 2002 – SPLA and Sudanese sign agreement on six-month renewable cease-fire in central Nuba Mountains – a key rebel stronghold. Talks in Kenya lead to a breakthrough agreement between southern rebels and Sudanese government on ending the civil war. The Machakos Protocol provides for the south to seek self-determination after six years. North-south peace deal2005 January – North/South Comprehensive Peace Agreement (CPA) ends civil war; deal provides for a permanent ceasefire, autonomy for the south, a power-sharing government involving rebels in Khartoum and a south Sudanese referendum on independence in six years’ time. 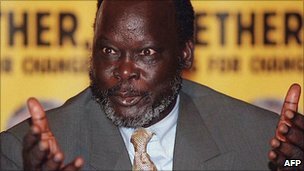 2005 July – Former southern rebel leader John Garang is sworn in as first vice-president. A new Sudanese constitution which gives the south a large degree of autonomy is signed. 2005 August – South Sudanese leader John Garang is killed in a plane crash. He is succeeded by Salva Kiir Mayardiit. Mr Garang’s death sparks deadly clashes in the capital between southern Sudanese and northern Arabs. 2005 October – Autonomous government is formed in South Sudan, in line with the January 2005 peace deal. The administration is dominated by former rebels. Fragile peace2006 November – Hundreds die in fighting centred on the southern town of Malakal – the heaviest between northern Sudanese forces and former rebels since the 2005 peace deal. 2007 October – SPLM temporarily suspends participation in national unity government, accusing Khartoum of failing to honour the 2005 peace deal. 2007 December – SPLM resumes participation in national unity government. 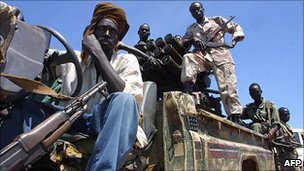 2008 March – Tensions rise over clashes between an Arab militia and SPLM in the disputed Abyei area on the north-south divide – a key sticking point in the 2005 peace accord. Tension over Abyei2008 May – Dominic Dim Deng, defence minister in southern Sudan’s autonomous government, is killed in a plane crash. 2008 June – Southern Sudanese leader Salva Kiir and Sudanese President Omar Bashir agree to seek international arbitration to resolve dispute over Abyei. 2008 October – Allegations that Ukrainian tanks hijacked off the coast of Somalia were bound for southern Sudan spark fears of an arms race between the North and former rebels in the South. South Sudanese leader Salva Kiir warns his forces are being re-organised to be ready for any return to war with the north. Ex-foreign minister Lam Akol splits from South’s ruling SPLM to form new party, SPLM-Democratic Change. Independence referendum2009 December – Leaders of North and South reach deal on terms of referendum on independence due in South by 2011. 2010 January – President Omar Bashir says he would accept referendum result, even if South opted for independence. 2011 January – The people of South Sudan vote in favour of full independence from Sudan. 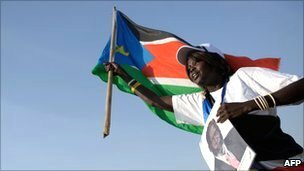 2011 February – Clashes between the security forces and rebels in southern Sudan’s Jonglei state leave more than 100 dead. Fighting breaks out near Abyei. 2011 March – Government of South Sudan says it is suspending talks with the North, accusing it of plotting a coup. 2011 May – North occupies disputed border region of Abyei. 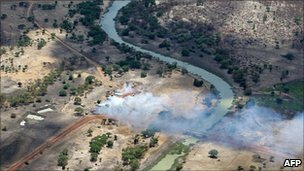 2011 June – Governments of north and south Sudan sign accord to demilitarize the disputed Abyei region and let in an Ethiopian peacekeeping force. New state born2011 9 July – Independence day. 2011 August – UN says at least 600 people are killed in ethnic clashes in the state of Jonglei. 2011 September – South Sudan’s cabinet votes to designate Ramciel – a planned city in Unity State – as the future capital. 2011 October – President Salva Kiir makes historic first visit Khartoum since independence. South Sudan and Sudan agree to set up several committees tasked with resolving their outstanding disputes. At 75 people are killed when rebels of the South Sudan Liberation Army attack the town of Mayom, in Unity State. 2011 November – South Sudan blames Sudan for the aerial bombardment of a refugee camp in Yida, in Unity State; Sudan’s army denies being responsible. 2012 January – South Sudan declares a disaster in Jonglei State after some 100,000 flee clashes between rival ethnic groups. 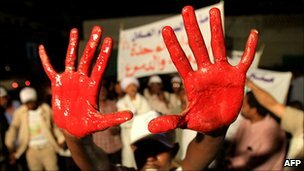 2012 February – Sudan and South Sudan sign non-aggression pact at talks on outstanding secession issues, but Sudan then shuts down the South’s oil export pipelines in a dispute over fees. South Sudan halves public spending on all but salaries in consequence. 2012 March – Around 100 people are killed in raids on cattle camps in Jonglei State by rival ethnic groups. A new chapter in the geopolitical tale of two countries opens on Saturday as South Sudan gains nationhood. But how did we reach this point? When the European governments sliced up Africa at the end of the 1800s, the vast, arid zone of the Sahara and the Sahel was intended to be French. But a plan by France to build a huge dam for irrigation on the Nile, which would have diverted the water, alarmed the British. 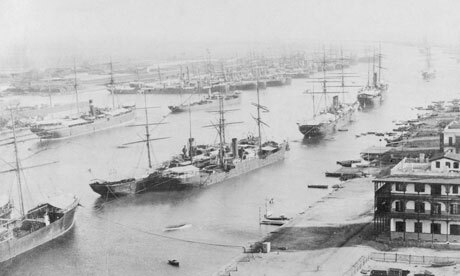 The British panicked that any diversion would result in the Nile no longer reaching Cairo. Egypt was the door to India, and the route to India had to be British controlled. To ensure this door remained open, the thinking went that Egypt must remain under British influence to control the eastern Mediterranean and the newly acquired Suez Canal. As Egypt depended on the Nile, so the Nile – right up to its source in Uganda – must also be British. After a stand-off in southern Sudan, the French withdrew and Britain took over the Nile basin and created Sudan. Britain also pursued its mission to abolish slavery in Africa. That meant stopping its Egyptian allies and the northern, Arabised Sudanese Muslims enslaving the black African southerners. So the British ruled Sudan as two separate territories until 1946. In the north they simply retrained the class of civil servants who had served the Ottoman Empire and the Islamist ruler known as the Mahdi. In the south they ruled through the chiefs and kings of more than 200 ethnic groups. Northerners were not allowed to spread Islam in the south but Christian missionaries were encouraged. Only in the north did the British instigate any development. The south was ruled but left to rot. In the lead-up to independence in 1956 southern army officers – still referred to as Abayid, slaves by some northerners – rebelled. This turned into a full-scale battle for independence six years later and it lasted until a peace treaty in 1972. But the south and southerners were still discriminated against, and a new rebellion started in 1983. Officially this was not for independence but for a united, secular, democratic Sudan. The rebel Sudan People’s Liberation Movement had many northern followers in the early days. But, apart from John Garang, its leader, all the SPLM members I have spoken with admitted in private that the ultimate solution was separation and independence of the south. In Khartoum, the capital, you would have barely known there was a war on. The chattering classes rarely spoke about it, the newspapers rarely reported it. But on the outskirts of the city, vast shanty towns made of cardboard and plastic sheeting grew like fungus. More than a million southerners camped out on the fringes of the city, having fled the war zones and living on handouts from aid agencies. The only thing the government did for them was occasionally to send in the police to bulldoze their settlements, driving the people further out into the desert. In the south, the war was like a boxing match on a football pitch. In the rainy season the SPLA fighters would attack small towns, lay mines on the roads and ambush vehicles. In the dry season, the government troops would advance out of the towns and drive the SPLA back into the bush or across the border into Ethiopia which supported the SPLA. No development took place. There were few schools, almost no hospitals or medical centres and no roads or economic development. Outside the war zones people lived much as they had for thousands of years, many probably unaware they were in a country called Sudan. In the war zones thousands of young men were seized by the SPLA and force-marched across the border into Ethiopia to be trained as fighters. Others were forcibly recruited in the Sudan government army. Today the human condition in South Sudan is appalling. Infant mortality rates are estimated to be around 150 per thousand births, the worst in the world. One effect of 9/11 was that the US started looking for solutions to conflicts throughout the world that involved Islamist fundamentalism. The brutal, but smart and pragmatic, regime in Khartoum was now courted, and a peace process began. Oil had just begun to flow and the revenues were pouring into Khartoum’s coffers. The faction in the capital who preferred to establish an Islamic state in the north and let go of the south dominated those who wanted to retain a united Sudan at all costs. The US-brokered talks between the government and the SPLA culminated in a peace agreement in 2002, though how many in Khartoum took independence seriously is doubtful. The southerners felt they had won and in the referendum early this year voted almost 100% for independence. The new government has almost no capacity to run a village, let alone a country. The political bosses are almost all former military men best known for their duplicity and greed and all of them bedevilled by tribalism and factionalism. Throughout the war many of them changed sides, some several times, taking money and positions from the Khartoum government whenever it suited them. Grotesque palaces are sprouting up around Juba, the new capital. The long-suffering population is as poor as ever, uneducated with little access to trade or markets. Landlocked and desperately poor, South Sudan is also at the heart of a troubled zone with not a single decent road to the outside world. Uganda’s Lord’s Resistance Army is still on the rampage in the Democratic Republic of the Congo and Central African Republic to the west. To the east there are periodic uprisings in Ethiopia’s south-west provinces. And to the north lies their old enemy which has its hands on the oil tap and the oil revenue. The pipeline goes north-east to the Red Sea but now most of the oil lies under the south. And the border is not yet agreed. The border regions that supported the SPLA are now being ethnically cleansed by Khartoum’s army. Khartoum will almost certainly ensure that the south remains divided by funding and arming enemies of the new government. The 25 Dec. 13 is our humblest Xmas ever in the world’s newest nation, South Sudan. The Christmas day is very important to all Christians around the world including South Sudan. The average South Sudanese usually organises elaborate Christmas celebration by purchasing new set of clothing by November and early December. Homes are decorated with new paint and flowers. The family then prepare particular food, cookies, sweets and refreshment for kids on the 25th day, the supposed birthday of the Lord Jesus Christ. All this has been disrupted by the attempted coup ten days earlier. 15th December was like the twelfth anniversary of the 1991 massacre of Bor people if ever this day was commemorated. Though it began in Juba, the South Sudanese capital as an attempted coup, it went all the way to this unfortunate city inhabited by the most peace abiding people, the greater Bor People. By any standard, nowhere in the world is the phrase ‘‘history repeats itself’’ more apparently tragic than Bor, the capital of Jonglei State. The massacre of 1991 had touched everyone’s life in many ways. The orphans still enjoy disarray in their lives to date. It is insignificant to talk about lost property because life is more precious. Any living being can gain when peace is first established. The talk of professionalising the SPLA has been discussed many times but little is done so far. What we see in this vital security service are rebellion by spending a few months in the bush and later be reintegrated in to the army with various acquired ranks in the wilderness. This is a catastrophe in the supposedly guerrilla army with little room for professionalism. What remains of the SPLA as a result, are indiscipline and side switching as was the case after that failed coup attempt. Two Divisional commanders, both Major-Generals, switched sides instantly on hearing the rumours of ethnic cleansing. One of these commanders may be paranoid. He had been a notable dissident and had more than ten side switches to his name. The other one had not been linked to any rebellion prior to this. It is often said that the truth, is the number one casualty before, any war and this coup attempt that might develop into a senseless war was no exception. South Sudan may be on the brink of war. This was the opinion in and the beyond the region. The IGAD foreign Ministers of Ethiopia, Somalia, Kenya, Uganda and Sudan arrived in Juba on 22nd December to try to initiate dialogue between the government and the coup plotters some of who are arrested. The government insists on detaining them despite calls for their release by human right activists and their supporters. The ring leader or the mastermind behind the coup and the rebellion is also urgently calling for the release of his accomplices’ colleagues before, any meaningful talks to negotiate their return to power. This is premature and is unsustainable in the current situation. The arguments of who started what and who kills who are also irrelevant but the solution of the matter is crucial to stop more bloodshed and sliding back to civil war. As things stand, the solution is a kind of compromise that maybe in form of power sharing between the key antagonists or tribes. The power sharing, accommodation and the policy of appeasement had been in play since CPA. You never know what the human mind is made of. The Dinka people believed that the hyena does not touch or eat a human head/brain because it had no knowledge of what it contains. This is apparently true because human relations are complex when it comes to dealing with one another. Once a human-being has achieved a certain stage he/she is no longer motivated by it. This explains what is currently happening in South Sudan. The former Vice President was no longer motivated by his position and the kind of wealth and resources he had accumulated. The same to the rest of those behind bars who have been in the government since 2005 in various capacities. This group is the one now crying foul against corruption in the government and lack of democracy in the party, SPLM. Notably, all of them were part of the rot in the government of Southern Sudan and the government of the Republic of South sudan but they can’t acknowledge their part of the rot in the system. One South Sudanese commentator blamed them for failing to accept their share of wrongdoing and clearly articulate the new path they would take during their news conference on December 6 2013. Instead of bringing forth higher ideals that day, they remained as simple as ever before. The talk of corruption, anti-Garang, NCP and other parties’ members taking over the SPLM led government, liberation generals have been dismissed from army and President surrounded by bad people are nothing new. What did they failed to articulate these points while in government. This is the reason why some of us are sceptical of what this group can offer now and in the future. Most of them are as dirty as pigs in the mud of incompetence. I suppose all of them have been served with letters to return loots to a government chest but failed to do so. They are among the notorious 75 who misappropriated funds from the government. Here, we lie in our misery caused by the insatiables. On this stage, I partly agree with Princeton Lyman that the failure to democratise by the SPLM has brought the current crisis. But this is not the simple matter of democratising the party, it is something more. There are many other political parties operating in the country. This group should have simply exited the SPLM and form their democratic party they can run as they wish. For if one cannot form and run a party how can he claim to democratise an undemocratic party. There is no way. The events of 1991 and formation of SSIM and SSDM are a testimony. The president after quelling the coup and unrest needs to crack the whip this time round. We all have seen the fruits of unsuccessful democratisation. This ideal is not the most important currently in the new nation; service delivery is the most important. Some of us have been critical of the policy of appeasement and open-ended amnesties. Taking up arms and coming back for positions received undue praise in the past. However, this is what is killing democracy and therefore, the country. Our view is that, South Sudan is not ready for liberal democracy. Check South Sudan Feigning Democracy and Human rights by this author on Southsudannation.com and paanluelwel2011.com. There are many other alternative suggestions to liberal democracy by South Sudanese on the net and other publications. There is an urgent need to stop too much focus on democracy. It was tried but less was achieved. There is need to do away with elections because there are no resources to manage them. People can be appointed like what the president had done in parliament and that of some State governors. It is observable that many commentators want the old system of posting individuals to different locations in the country regardless of their ethnic origin. The Jonglei state government already implemented it. County and Civil Administrators are the case in point in that state. Democracy is really blackmailing this country. Individuals can do some nasty things but invoke the name of democracy. This is the second time now for Riek to kill civilians in the name of unknown democratic ideals. The Citizen Chief Editor proposed that the country be led by a military leader for ten or fifteen years after which democracy can set in gradually. Many misinformed people blame the president about lack of democracy but it is actually our misunderstanding of democracy that should be blamed. You can see why those against the so-called liberal Western democracy couldn’t be more right. They clearly perceived that our people are vastly illiterate. They can be cheated in the name of democracy they don’t understand. They even don’t understand very well their customs that have long been handed down by their great ancestors. These customs have never been firmly put in to books and are not even properly explain to posterity. They are therefore, subject to manipulation by those in charge to suit their needs. Dr. Riek Machar is not even an average leader South Sudan wants. Many South Sudanese voiced this concern in the past and the calls will only grow louder this time with these events. What we know of this prospective president is diabolical smile most of the time in public arena. What we don’t know is how much is the hatred or love behind the monotonous smiles. I was of the opinion that the guy must be an action oriented man because he is highly unconvincing when it comes to articulating matters through speech as a political leader. On one instance, when he was quiz by journalist why he accepted another position when the constitution was against another appointment besides that of VP. His answer was that, his bodyguards advised him to do so. You can see the kind of a leader he is. He is neither action oriented nor comprehensible politically. Dr. Riek is a tribal leader in every sense of the word. He endeavours to articulate one thing, but does something different altogether. The events of 1991 illustrated this point. He purported to fight for greater democracy in the movement but nobody can remind you that he failed miserably and ended up in Khartoum. He let loose his Nuer tribesmen to lynched Dinka officers under his command. His atrocities culminated in the invasion and annihilation of Bor Dinka. This is clearly the case in 2013 in an independent South Sudan. One can’t comprehend why some folk like Rebecca and Dr. Agot follow him. They were not aware that the whole saga will end up in Bor as usual. This was a blackmail disguised in the fight for greater democracy in the SPLM party. The two not only have erred to be disciples of someone who wields a tribal card but also accepted to be part of a team assembled through quick and dirty methods. Riek is now firmly back in his tribal fiefdom. For how can someone explain his escape to Leer, his birth place and then to Bentiu were he commands massive support. He will now negotiate on behalf of unwanted militia dotted with many generals outnumbering foot soldiers. Many militias have already benefitted through reintegration since CPA. This is nothing new but how long shall it continue. It is done on the expense of faithful SPLA soldiers. It will be too much to integrate self promoted militias and promote other officers who have been faithfully in the service at the same time. The budget is prohibitive. You can see that Dr. Riek has miserably failed the test of democracy the second time. If elections are held today, the knowledgeable Doctor can hardly garner Dinka vote particularly if Dinka vote as a block. However, Dinka has never been known to be a solid single vote block. it is not difficult to distinguish a tribal leader despite other gestures they make. For these reasons, neither liberal democracy nor dictatorship is the ideal form of government for South Sudan. The warring leaders for positions should endeavour to stop the ongoing bloodshed and move quickly to defuse tensions they have helped tribalised. The leadership of this country should be modelled on our traditional forms relevant to South Sudan. Give peace a chance once again. Remember to play without your too much reliance on a tribe for you will not succeed on this shaky ground. God bless South Sudan and a happy new year 2014.
web page. You are extremely sensitive and impressionable at this time. Perhaps you are obtaining too concerned and become susceptible to feeling their feelings. This image is so disquieting is that of the Moon. Some strong magnetism exists in between you and somebody you satisfy this Halloween.